What are you willing to change to live the life YOU deserve? Do you often find yourself in one-sided relationships? Do you take responsibility for other people’s mood swings and actions, even when you’ve done nothing wrong? Are you overworked and overstressed because you pick up the slack - at work AND at home? Are you the “on-call everything” - the person that everyone takes from until you have nothing left to give (and then they leave you hanging)? Between the normal challenges of relationships, the horror that is the current socio-political climate and the everyday woes of adulting…life is tough. It’s even tougher when you feel like you’re being stepped on at every turn. As we become more attuned to the life we want to live, we also can see more clearly what we DON’T want to accept anymore. In order to live our #BestLife and demand the respect that we deserve we need to stand up for ourselves - but HOW? Maybe you tiptoe through life trying to “keep the peace” or save face, when you really want to scream at the top of your lungs? Do you have trouble making decisions, let other people choose or find yourself saying “I really don’t care” , when you REALLY do? Do you overshare the gory details of your life at work, or constantly find yourself on the receiving end of the hottest, but least necessary, gossip? Do you think of yourself in terms of what other people say about you, so much so that you start to wonder WHO you truly are? And you don’t have to figure it out all on your own. I wrote this workbook because, as much work as I’ve done on this over my life, I STILL found myself in situations where my boundaries weren’t being respected, where I wasn’t respecting them myself and even areas where I didn’t even know boundaries should exist. We’ve all been taught, by one oppressive system or another, that we should just keep quiet and go with the flow. Be nice, let people slide and everything will be okay. The tides are turning. It’s time for a change and just by arriving here, on this page, you’ve already taken a first step. In this workbook, I offer practical observations from my own experience of setting, embodying and strengthening my boundaries. 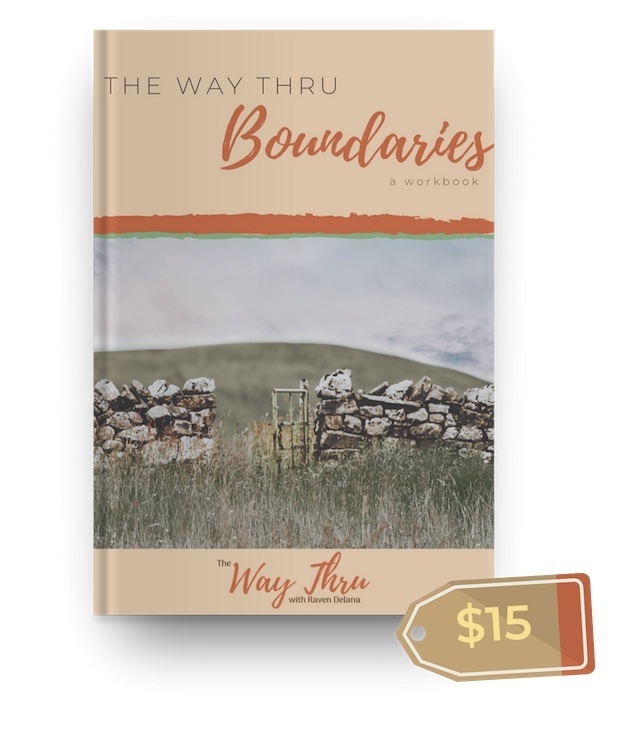 We walk through each of the six types of boundaries and explore what impact boundary work can have on our lives - hint: it’s not always fun, but it’s totally worth it. Then, I share examples to help you practice how to communicate your boundaries - vocally or non-vocally - with the people in your life. And finally, because I know that “hurt people hurt people”, we talk about how to check yourself to improve the way YOU honor the boundaries of the people you love. "The most impactful moment was when I realized the effect setting and holding this boundary had on my entire life - not just my mood, energy, or ability for stronger performance at work, but also to the relationship I had with myself and with my partner. It made me realize the impact this one boundary had on my entire life. "The most important part of this book to me is learning how to see outside of yourself. Everyone always says "don't take things personal”, but how is that possible when the thing is happening to you? Raven guides you through what this really means - you can only be responsible for yourself. Learning to release other people's baggage and let it return to them is a valuable lesson. It takes practice and it takes time but once you learn to do it....it's freedom time! Click below to join the email list and get one of 50 free copies of the workbook. 2. Check your email to complete the process to join the email list. The link to download will be delivered by email as well. If you get into the workbook and find that you’d like support in bringing a new boundary to your life or re-defining one that has been violated time and time again, I’m here. Let me walk you through the processing of one challenging boundary in a #TWTBoundaries Coaching Session. 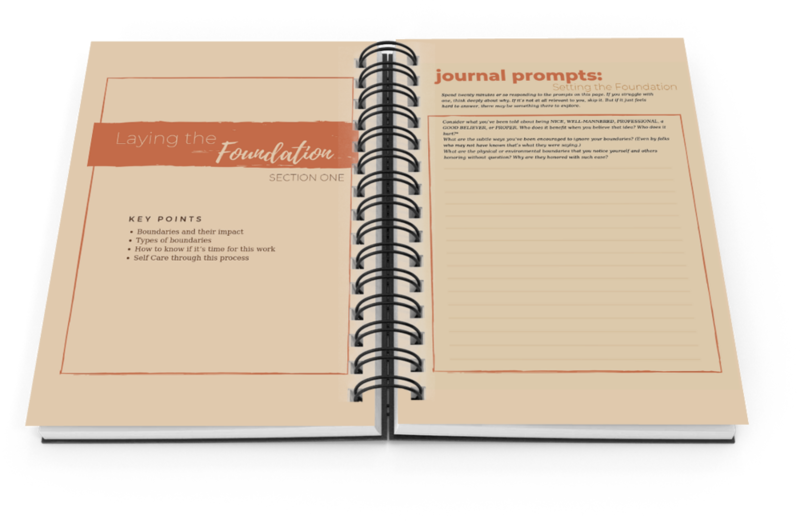 We’ll go through Section One of the workbook together, get clear on WHY this boundary is important and HOW you can make a change right away. Schedule a #TWTBoundaries Coaching Session. "I’ve been doing this boundary work (consciously and intentionally) for over 10 years - and I’ve worked very hard. Thinking about all the areas in my life where I still need to do a lot of work is overwhelming. It was so useful to explore just one boundary in my session with Raven. There were so many layers we had to peel back before I was able to get the clarity I needed to redefine this boundary, embrace it, own it, and take immediate steps to enforce it, starting with myself. It was one of the most transformational hours I have had this year. There were moments where things got intense and I even got a headache. Raven carefully and effectively guided me to listen to what my body was communicating to me. We were able to unlock the connection between the headache and the resistance I had towards setting a boundary in that area of my life. The answers I needed were RIGHT THERE! By the end of the session, I felt satisfied, relieved, and empowered. Thank you Raven for breaking this process down and making this difficult work feel doable." When I first announced that I was putting this workbook together, I thought I’d give it away for free. It started as a simple way for me to gather my thoughts and share with the folks who had been following along on Instagram. As I got to work, I realized that there was SO much to say. I wanted to give it all that I had, and I did. The more I worked on it, I realized that I have to be clear and consistent about MY OWN boundary - expecting an equal exchange of energy for the work I share. Luckily, I found a way to honor my word AND get what I need. If the $15 price isn’t accessible to you right now, I’ve made 50 copies available for free. No hoops to jump through, just click here to download it. It’s my gift to you. Raven is the Founder, Strategist, Transformational Coach at The Way Thru. She supports creative thinkers and shift makers as a mirror to help you see your blind spots, a magnifying glass to bring your vision into focus, and a spotlight on your shadows so that you can do the work required to up-level your creative venture, get out of your own way and contribute to your community in meaningful ways. Raven has spent 15+ years developing marketing and operational strategies for solo business owners. Now – having made peace with depression, anxiety and childhood trauma – she is on a mission to help other perfectly imperfect visionaries work through the barriers and get their work into the world using practices such as self-care, mindfulness, meditation, and yoga. For technical support, questions or…anything else…email ravendelana[at]gmail.com.